The Brazilian three-banded armadillo (Tolypeutes tricinctus) is also known as tatu-bola (ball armadillo). It is one of only two species of armadillo that can roll into a ball. As its name suggests, the Brazilian three-banded armadillo is indigenous to Brazil, living primarily in the eastern part of the country, just south of the equator. Brazilian three-banded armadillos have a head-and-body length of about 22 to 27 cm and the tail is between 6 and 8 cm long. They weigh 1–1.6 kg . The armor is composed of ossified dermal scutes covered by nonoverlapping, keratinized epidermal scales, which are connected by flexible bands of skin. The underside of the body and the inner surfaces of the legs have no armored protection, and are covered instead by long, coarse hair. 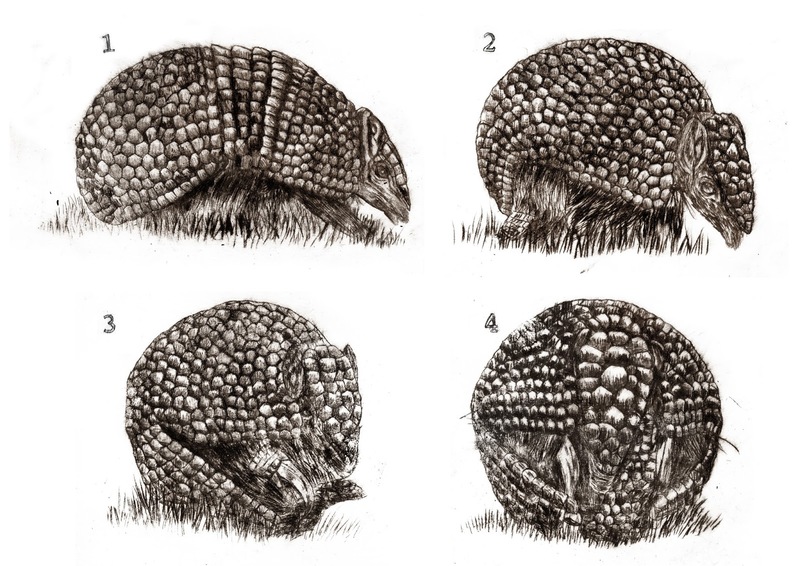 The genus Tolypeutes, which includes both the Brazilian and southern species of three-banded armadillos, is unique in the ability to roll up in a tight, almost impenetrable ball. This is because their armor is slightly looser than that of other armadillo genera, which allows for greater freedom of movement. The illustration shows the stages of ar "rolling up", and it was made using drypoint technique.